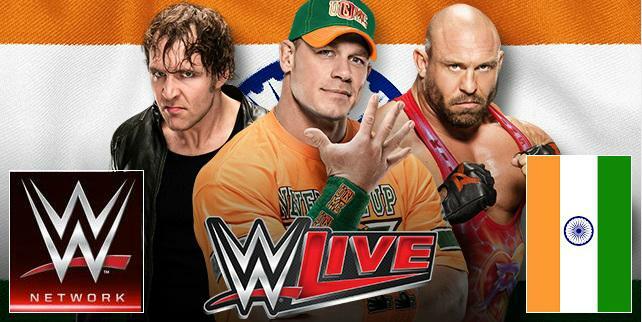 WWE LIVE event will be taking place in India for the first time in 13 years on the weekend of 15-16 January 2016 with the likes of Cena, Big Show, Ryback, Sheamus and some other unconfirmed stars lining up for indian tour. here are the details about tickets and schedule of WWE tour of India. WWE Live will be touring India early in 2016 on the weekend of 15-16 Jaunary 2016 at the Indira Gandhi Indoor Stadium in New Delhi. TenSports is major sponsor for bringing WWE in India and they will broadcast the event live on TenSports/Tenaction in india and Pakistan. The first phase of ticket sale began on 04 November 2015 which is already sold out but fans can still get hold of tickets starting from 10th november at the in.bookmyshow.com. The finaly lineup of stars who will arrive in India for the two day action will be announced in december but WWE has confirmed the following stars (John Cena, Dean Ambrose, Big Show, Ryback, Sheamus and Cesaro). WWE and Tensports has struck a deal which will see an annual event in India every year starting from 2016. TenSports also broadcast all WWE Raw, Smackdown and other PPV events live in the India and other subcontinent countries. How To Buy Tickets Online For WWE Tour of India 2016 ? You can buy tickets for WWE for the two day action (friday, 15 January and Saturday, 16th January) on indian ticket website here is the url (in.bookmyshwo.com/sports/wwe-live-india-tickets/). Ticket prices starts from indian ruppe 2499 to 9999 inr. The schedule of the event is as follow. I have ONE EXTRA TICKET for the WWE Live Event New Delhi on 16th of January. Pretty good seat, close to the ring. If anybody needs one, please buy it from me. I have wwe ticket ……..anyone can contact me.